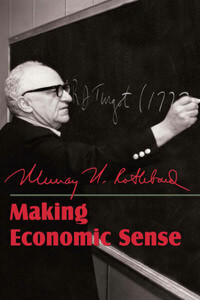 The goal of this hefty tome (551pp) by this master economist is to communicate with the public about economic theory and policy, in the form of articles that appeared in the Mises Institute's monthly . This is the expanded Second Edition, and it includes 117 articles--several additional ones that were left out of the original. It includes "Taking Money Back," a 25-page populist case for the gold standard, his famous "Protectionism and the Destruction of Prosperity," along with a new essay on fixed-exchange rates, and an obituary of Ludwig von Mises. It also has a new introduction by Robert Murphy. For this reason, it is nearly 100 pages longer. No economist has ever written so clearly about subjects usually wrapped in mystery. Even when discussing exchange rates, interest rates, and central banking, Rothbard is clear and persuasive. That's what makes this book so wonderful, and so dangerous to the purveyors of economic fallacy and those who enforce their ideas on the public. Robert Murphy has written that it was this book that is most likely to get people interested in economic issues. Rothbard's prose is witty and strong, and his logic is compelling at every step. "Divided up topically, the book touches upon almost every important policy issue that has been before the public during the last decade... Reading through these over 100 articles reminded me just how deep my intellectual debt to him really was, and how richer the cause of freedom has been because of his writings over the decades." Richard Ebeling, Foundation for Economic Education.